One of the challenges brought on by the digital revolution of the recent decades is the mechanism by which information carried by texts can be extracted in order to access its contents. The processing of named entities remains a very active area of research, which plays a central role in natural language processing technologies and their applications. Named entity recognition, a tool used in information extraction tasks, focuses on recognizing small pieces of information in order to extract information on a larger scale. 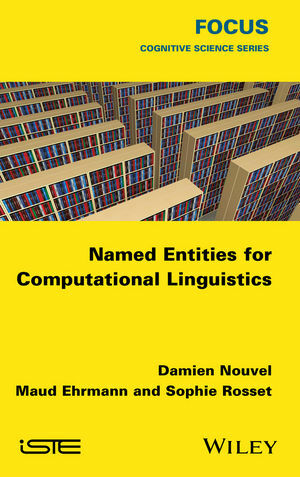 The authors use written text and examples in French and English to present the necessary elements for the readers to familiarize themselves with the main concepts related to named entities and to discover the problems associated with them, as well as the methods available in practice for solving these issues. Damien Nouvel is Associate Professor at the National Institute of Oriental Languages And Civilizations (Inalto) in Paris, France. Maud Ehrmann is a Research Scientist at EPFL (École polytechnique fédérale de Lausanne) in Geneva, Switzerland. Sophie Rosset is a Senior Researcher at the French National Centre for Scientific Research (CNRS) in Paris, France.